Duration: The B.Ed. programme shall be of a duration of two academic years, which can be completed in a maximum of three years from the date of admission to the programme. a) Candidates with at least 50% marks either in the Bachelor's Degree and/or in the Master's Degree in Sciences/Social Sciences/ Humanity, Bachelor's in Engineering or Technology with specialization in Science and Mathematics with 55% marks or any other qualification equivalent thereto, are eligible for admission to the programme. (b) The reservation and relaxation for SC/ST/OBC/PWD and other categories shall be as per the rules of the Central Government / State Government, whichever is applicable. Candidates can apply in person or by post. Application Form available in the college office. 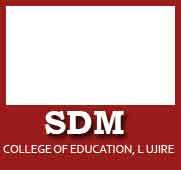 All original Marks Card ( SSLC, PUC, DEGREE, PG) of the qualifying examination and one set of photocopy. CD – (All scanned documents of original marks card, Photo, signature of the candidate.